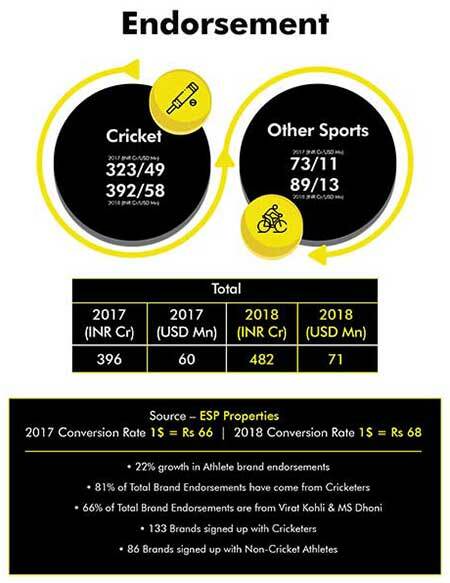 GroupM’s sporting and entertainment property ESP Sports released the sporting sponsorship data report of India yesterday at a media event. Vinit Karnik, Business Head, ESP Properties, GroupM took the media attendees through the report and gave us insights on the ad spends of the year. 2018 was a spectacular year for the business of sports and 2019 will be another power-packed year. With IPL being telecasted and ICC Cricket World Cup coming up, sports will be the talk of the town, monopolising consumer attention and advertising money. On ground, cricket alone has grown a 34 per cent which means almost a growth from 669 crores to 899 crores from Jan 1, 2018 to Jan 1, 2019. “The IPL central sponsorship has grown and 155 per cent growth rate has been seen. On the backhand of VIVO and Paytm all the deals that were renewed at a premium pricing has helped the number,” stated Karnik. What IPL teams do now is whatever sponsorship amounts they extract, ten per cent of that revenue they give back to BCCI. “It is a royalty rather than a franchise, that money is counted somewhere, there is no difference in the industry size because we are capturing that number in that franchise fee model which will now get moved onto the sponsorship fee like gate revenue or a licensing deal. 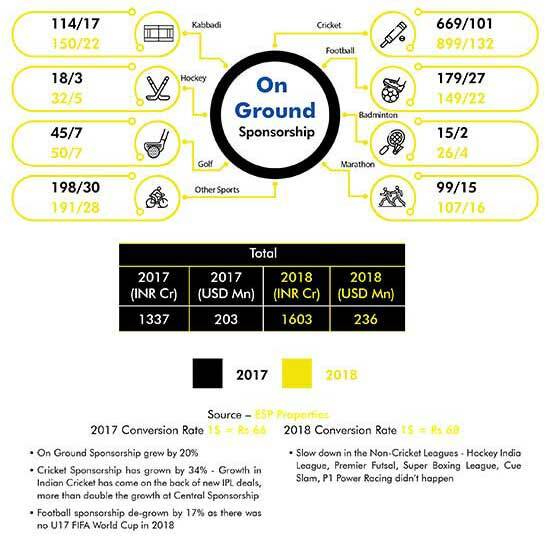 Team sponsorship revenue is up by 9 per cent cricket team sponsorship, the good part about the team sponsorship, IPL teams for the first time crossed the 299 crore mark. Which means that almost 14 crores per team are what they are possibly writing as team revenue that is a very healthy sign from team economy standpoint,” remarked Karnik. Sports sponsorship has grown by 12 per cent. The size of the industry is at 7,762 crores without franchise fee. “The media investment in sports grew by 9 per cent sounds a little low because India played less amount of cricket last year. 85 per cent of the overall ad spent have happened on TV. So, TV still drives the bulk of the growth story in India. 44 per cent of growth has come from digital media which is predominantly driven by Hotstar and Sony LIV and these two platforms have the best rights possible. The revenue on OTT is coming only on the backing of cricket. 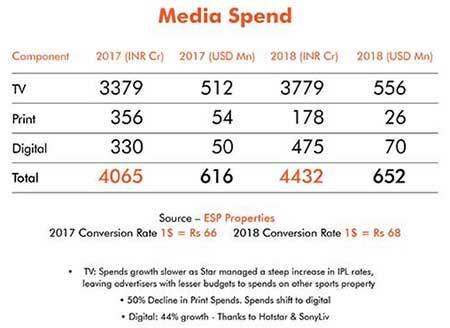 TV is at 3779 crores, digital is thriving at 3379 crores and print is declining with a revenue rate of 178 INR crores,” said Karnik. IPL and elections clashing will not be an issue. Karnik said that it won’t affect the world cup ad spends either since India is a cricketing nation.